Sessions take place in the morning. See the table below for event times, and meet at the listed location. Please sign up in advance to attend. Registered Stewards receive a sign-up evite prior to each session. If you’ve never attended a Stewards session, register online first to get on our evite list. Please e-mail our Garden Stewards Assistant Kristen Johnson at kjohnson@arboretumfoundation.org with any questions. Help Care for the Arboretum! Garden Stewards assist the staff gardeners in the monumental task of maintaining the Arboretum. Weekday gardening parties take place from mid-March through October. Sessions take place in the morning (times vary, so see the schedule above for details), and you are welcome to join us and help for as long as you can—an hour, two hours, or the entire three-hour session. What we do: Most of our time, we spend weeding in the beds along Azalea Way and in the Pacific Connections Garden, as well as in the Winter and Woodland gardens. We work with very knowledgeable gardeners who appreciate our assistance in helping to keep the Arboretum looking and feeling great. There are also opportunities for mulching and other gardening activities, if that is where your interests lie. Please email Kristen Johnson or call 206-963-0008 for more information. No gardening experience? Not a problem. Staff gardeners from UW Botanic Gardens guide our activities, and you will receive sufficient instruction to feel knowledgeable and successful on your very first session. An experienced gardener? Your expertise will be enhanced by working with the Arboretum’s very knowledgeable horticulture staff. No garden of your own, but love working with plants? Perfect—our garden becomes your garden. Love the Arboretum and want to give something back? 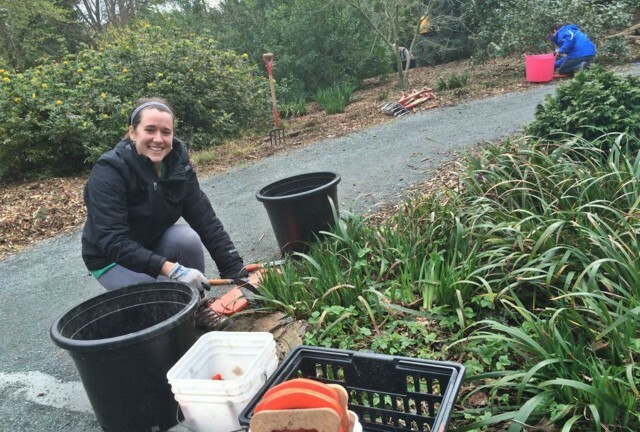 There are many ways to give back to the Arboretum, and many of our volunteers do give in multiple ways. If you love gardening, pitching in with the Stewards is a great way to give back—and one that you can see the results of each time you walk past an area that you’ve helped maintain! A student taking environmental, landscape, plant ID or other horticulture classes? Working with the Garden Stewards is a great way to develop hands-on field skills in your chosen area of study. Arboretum staff gardeners have a wealth of knowledge to share, and volunteering with the Garden Stewards program will give you valuable work-related experience as you build your CV and start your career. Benefits of volunteering: New Stewards receive training from staff gardeners in the use of tools and the identification of both weed plants and plants in the Arboretum collections. Stewards also benefit from other enrichment activities—including fascinating lectures about the history and collections in the Arboretum. Each year, we also participate in the Arboretum’s Volunteer Appreciation Party, a relaxing event celebrating the Stewards and other Arboretum volunteers for all of their hard work. Earning your vest: After you participate in 24 hours of stewarding—just eight three-hour sessions—you will receive a very useful Garden Stewards vest, to help you hold your personal items during your gardening sessions. Or download a volunteer application form, fill it out, and mail it to the Arboretum Foundation, 2300 Arboretum Drive East, Seattle, WA 98112. 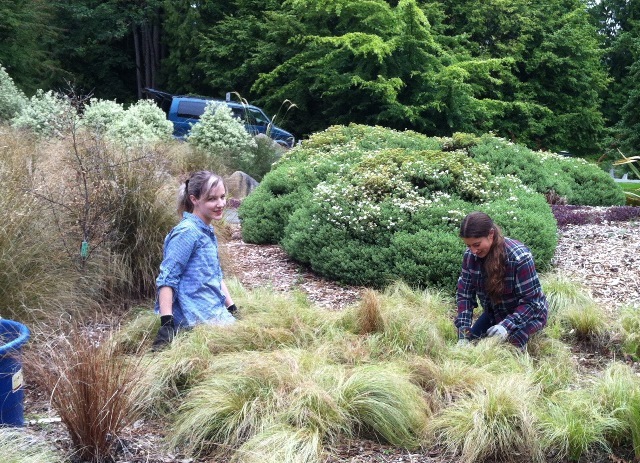 In fall 2011, in response to budget crises affecting the University of Washington and Seattle Parks and Recreation, the Arboretum Foundation and UW Botanic Gardens created a special volunteer program dedicated to the care and maintenance of the Pacific Connections Garden at the south end of the Arboretum. Our goal was to recruit and train a dedicated cadre of volunteers—the Pacific Connections Garden Stewards—who would, under the supervision of the Arboretum and UWBG horticultural staff, assist the small paid crew in caring for this new garden. 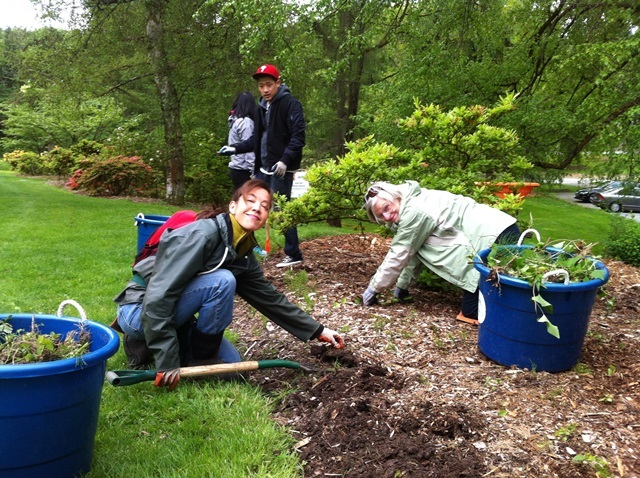 The program was a great success, and it inspired the Foundation and Seattle Parks and Recreation to create the Azalea Way Garden Stewards in summer 2012. This program has also been very successful in providing assistance to City staff in maintaining Azalea Way, an historic, Olmsted-designed display. In 2014, both programs were merged into one and renamed, simply, the Garden Stewards program. In 2016-17, at total of 27 stewards donated 875 hours of work to the Arboretum!